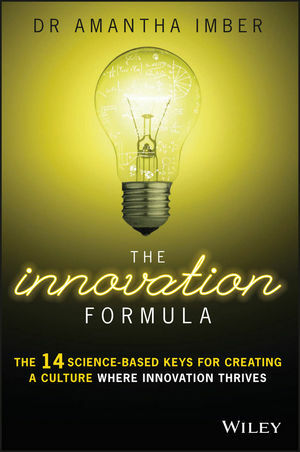 The Innovation Formula delivers strategies for building a culture where innovation can thrive, based on actual scientific research. Author Amantha Imber holds a PhD in organisational psychology, and has been called upon by a multinational roster of forward-thinking companies—such as Google, Disney, LEGO and Virgin—to improve innovation at all levels. In this book, she shares her strategies and helps you tap into a substantial body of scientific research to help further innovative practice within your own company. For example, rewarding failed innovations can actually be a critical aspect of building an innovation culture. It's rarely done, but it fosters creative thought by signaling to people that failure is tolerated and is a necessary ingredient in the pursuit of innovation. This kind of practical, easily implemented strategy is the lynchpin of cultural change. This guide shares fourteen separate, yet interconnected strategies for improving your company's innovation culture, and provides illustrative examples of real-world companies who are putting these plans into action. Business innovation guides tend to focus on how one company does it. But it's not your company, and just because it worked for Google or Apple doesn't mean that it's right for you. This book is different; these techniques are based on science, not gut feeling, and can apply to any organisation, at any level. Fostering a culture of innovation means making your company a safe space for new ideas. Over 95% of business leaders surveyed get it wrong, because intuition cannot compete with data. The Innovation Formula gives you a science-based framework for turning your organisation into one where innovation survives and thrives. DR AMANTHA IMBER is an innovation psychologist, best-selling author, and founder of Australia's leading innovation consultancy Inventium. Amantha is the co-creator of the BRW Most Innovative Companies list, a list that Inventium compiles annually ranking Australia's top innovators. She has worked with forward-thinking companies such as Google, Disney, LEGO and Virgin. For more information, visit www.inventium.com.au.